Alpha Sigma Alpha takes great pride in the healthy relationships we have created with our campus partners. With the growth and development of our collegians as the focus, our headquarters staff, advisors and volunteers work along with campus administrators to provide a positive experience for our members. We do so by communicating regularly, celebrating our similar missions and values and offering opportunities that allow women to lead, to serve and most of all to make a difference. Alpha Sigma Alpha sets high expectations for its collegiate chapters in a section of our national policies and procedures called Our Chapter…Our Commitment. Just as we do with our collegiate chapters, Alpha Sigma Alpha sets high expectations for its collegiate members in a section of our national policies and procedures called My Membership…My Commitment. Alpha Sigma Alpha outlines its position on matters important to our members through the Alpha Sigma Alpha National Policies and Procedures. These policies and position statements cover our stance on hazing, FIPG, human dignity, sexual harassment, media and internet usage. To receive a copy of a procedure please contact national headquarters. Alpha Sigma Alpha’s membership education programming focuses on individual, self-directed growth and learning. It carries the educational objectives of the Sorority beyond the new member period into a lifetime of development. To be given an invitation to membership, a potential new member must have at least a cumulative 2.5 (on a 4.0 scale) if she has completed one term as a full-time student at the university. If she has not completed one full term, she must have at least a cumulative 2.5 (on a 4.0 scale) from high school or a GED score of at least 510. All new members and initiates must maintain at least a 2.5 (on a 4.0 scale) term grade point average. If a member falls below a 2.5 term GPA, she debars herself from voting or holding office until both her term and cumulative GPA is above a 2.5. A chapter or emerging chapter must maintain a 2.75 (on a 4.0 scale) to remain in good standing. As a member of the National Panhellenic Conference, Alpha Sigma Alpha follows the NPC Unanimous Agreements regarding extension. 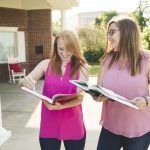 Adding a chapter to a collegiate campus is a process regulated by the NPC and more information about this process can be found on the National Panhellenic Conference website.